You may hear more of Lascaux, but the real center of France's prehistoric cave culture is Les Eyzies-de-Tayac-Sireuil, just a short drive to the southwest. Lascaux may be the most famous prehistoric cave dwelling in France, but the village of Les Eyzies-de-Tayac-Sireuil, 29 km (18 miles) southwest of Lascaux in the valley of the River Vézère (map), is actually the center of prehistoric Cro-Magnon culture and discoveries in France. 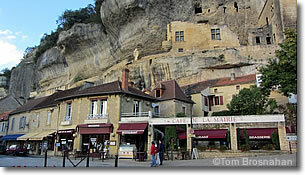 Numerous caves with mural paintings, bas-relief sculptures and artifacts, dramatic limestone rock formations and cliffs, and the Musée national de Préhistoire (National Prehistory Museum) draw visitors to this small town on the banks of the Vézère River. Although there are many sites and exhibits of prehistory for both adults and children to visit, some of them—the most in demand, in fact—limit the number of daily visitors severely, making access difficult to nearly impossible in the busiest months (July and August). Les Eyzies is served by TER regional trains, and the Gare (train station) near the Hôtel Les Glycines is only about 500 meters (547 yards) from the Office de Tourisme in the village center.